Nestled in a natural fording place on the Vltava River, a tributary of the Elbe, Prague is a City like no other. Intertwining, deeply cobbled streets flanked by monstrous buildings whose bold architecture stands testament to the pride, conflict, and passion that Prague has witnessed through the centuries. Not a trace of the action-packed, budget conscious, backpacking trips that Daughter number 2 is used to – this one was designed for Ease, Rest and Relaxation. Having to balance my budget to some extent, I chose a top hotel that was situated outside the main town – in Phara 5 (5th District; just a short distance from the City centre). After an efficient check in, and a reassuring introduction to our room, we ventured out and over the Vltava, keeping intentionally to the outskirts of the main City. Crossing the first bridge we came to, we were drawn to an interestingly ramshackle collection of stalls on the Rasin Embankment. It turned out to be a Farmers Market – what a find – buzzing with locals preparing for the festivities of the coming week. The welcome Whiff of spiced wine and cider warmed the freezing air. Freshly pressed hot apple juice in the making! More Hot Wine… can’t get enough of it in this temperature! Onion Pick N’Mix. 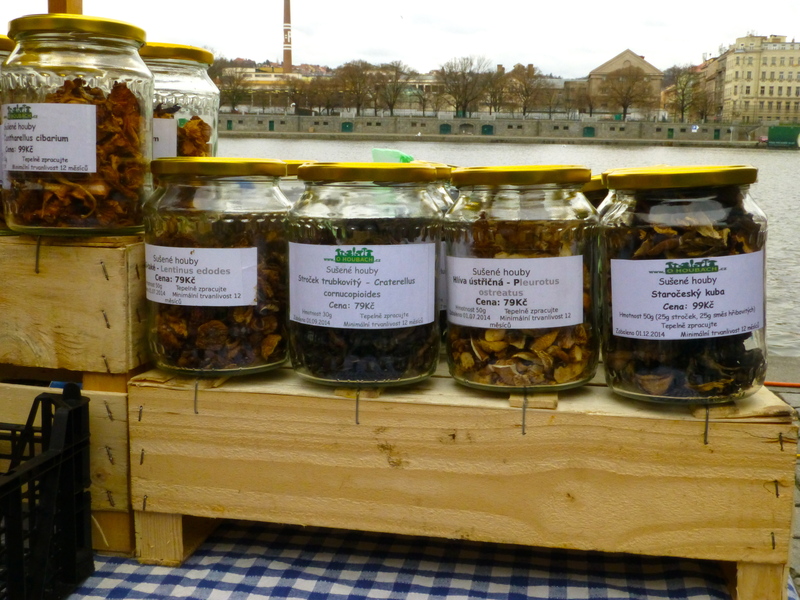 Farmer’s Market, Prague. Oyster Mushroom stalls – some also sold watery , steaming hot mushroom soup. Pots & Baskets; Farmer’s Market, Prague. 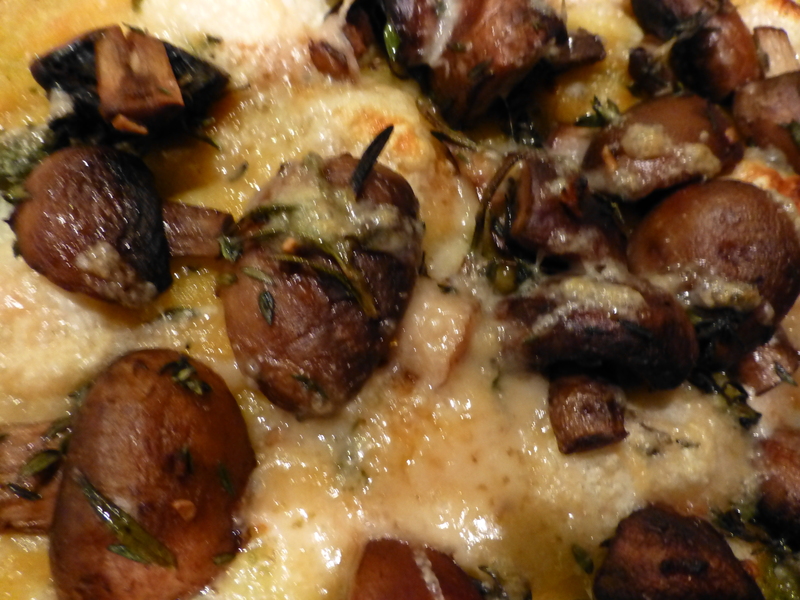 Oyster mushrooms – crates of fresh mushrooms & watery, hot mushroom soup. Lots of alternative health foods… this one sounds as odd as it looks! Christmas biscuits & cream horns. Brightly coloured cottage industry preserves. Woodworker, watched by a cluster of interested market-goers; noses dripping and cheeks white. There was a definite emphasis on ‘health’ and ‘natural’ products at the market. Wonderfully fresh looking vegetables – their odd shapes and earthy presentation proudly clarifying their status as ‘low food miles’ and Organic foods. Home crafted style honey, potted preserves, pickled vegetables and inedibly ‘healthy’ looking vegan, wheat free and vegetarian foods were being snapped up by trendy looking locals. Beeswax soap, candle & honey stalls. Vegan Delights… (and other in-edibles). 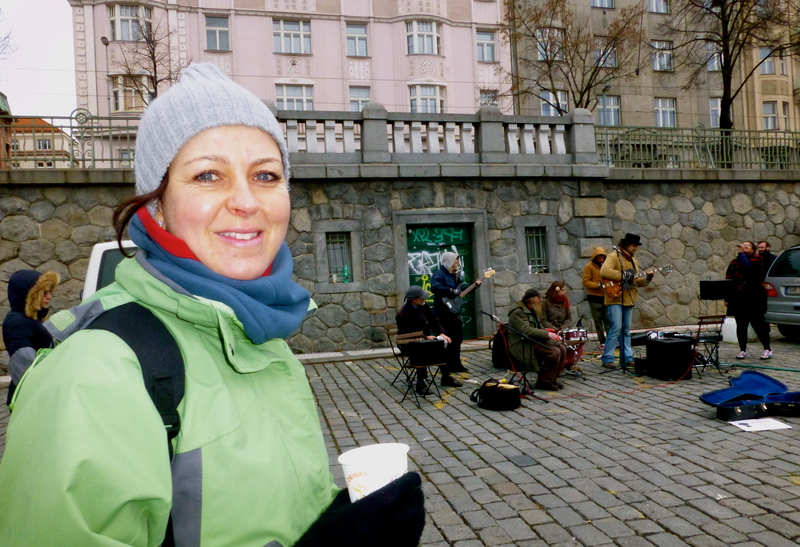 The market had a gritty atmosphere to it – making us feel at home, having left West Norwood just a few hours earlier… cosy beds traded for the crisp, grey wind on the banks of the broad River Vltava. Enjoyed by a crowd of Bohemians, who we were glad to join for some time. Then her lanky, shabby, middle-aged colleague took over. Suspense – what would be his ‘turn’? Weird, wonderful, boldly confident in an unassuming sort of way, and totally individual. A happy and perfect finale to the ramshackle, somewhat bizarre market. And a fitting introduction to Prague! The fact that the Vltava slices through the centre of Prague makes it a relatively easy city to navigate. We followed its broad bank, admiring the military style rows of grand buildings either side. Prague – River flanked by rows of grossly grand blocks. Painted soft orange, deep yellow, soft green or cream – all sporting the uniform red-clay roof tiles. 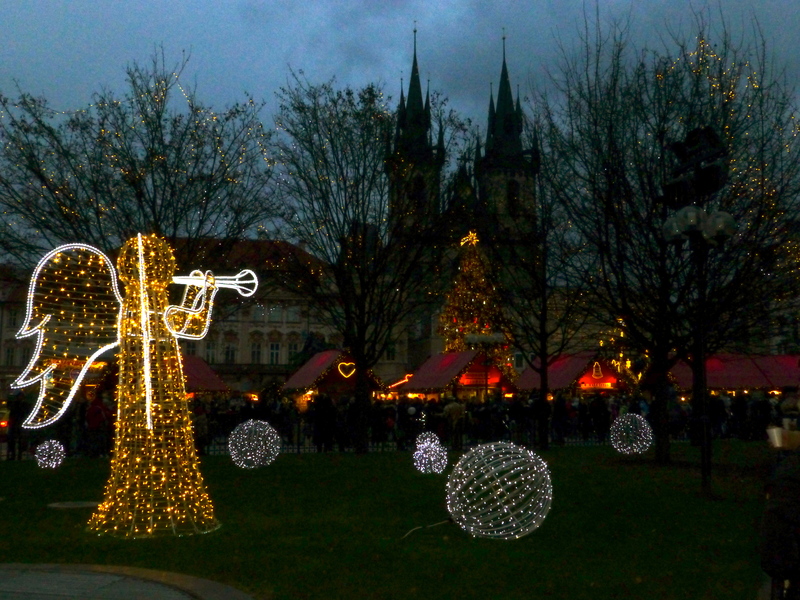 Visiting just four days before Christmas, the Christmas Market in the Old Town was a must. But a somewhat disappointing one, it has to be said. Stroppy stall holders, crowds, bustling without the joy. Rows and rows of tacky souvenirs, over-priced cups of poorly made tea, served without grace on dirty table cloths, all wrapped in a chill air. Despite having been advised to take a tram, nothing is too to walk in Prague – and doing so helps prevent frozen limbs in winter, I’m sure! So we climbed the deeply cobbled streets; eyes set on the prize looking down at us from the hilltop. 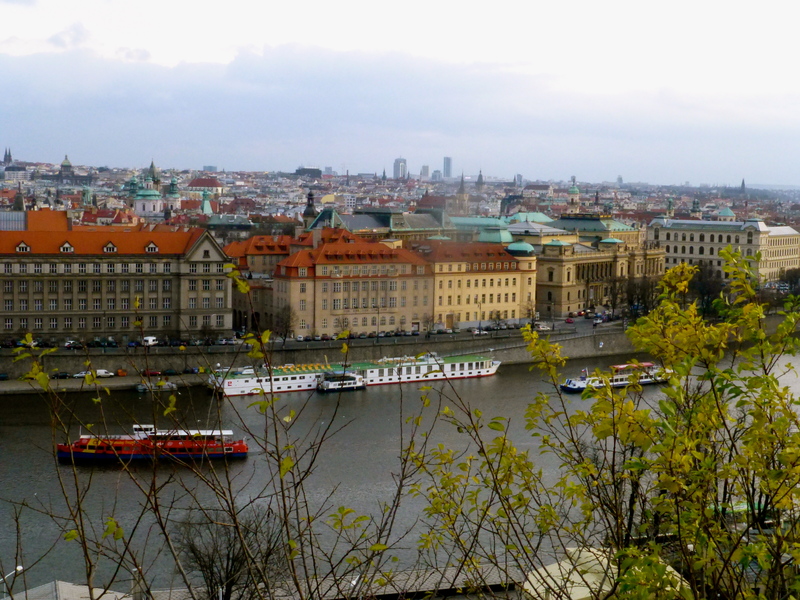 On the way up to the Castle, we were able to stop and look over the river – breathtaking views of Prague, and the lines of buildings – blocks created through the ages, reflecting different social & political periods and architectural styles – like strata plotting timelines in an ancient mountainside. ‘The Castle’ turns out to be more of a town in itself. Buildings & renovations dating back from the 13th century to the present day. Originally home of Bohemia’s Kings and now housing Czech Republic’s presidents, architectural styles through the ages are represented in grand proportions: Gothic, Renaissance, Baroque and Neo-classical. The waxy glow of the street lamps lends a warmer glow to Prague, despite the fact that temperatures inevitably plummet even further once the daylight has left. It must be simply stunning in the summer; vines on the hillside basking in sunshine, a sparkling Vltava sporting pretty tour boats, and cafes spilling over the cobbles with lazy lunches (and cheap beer??!). But dark winter evenings, lit by the ivory light from wonderful old lamps, combines with the magical architecture, misty winter chill and cobbles to create a truly memorable atmosphere, too. 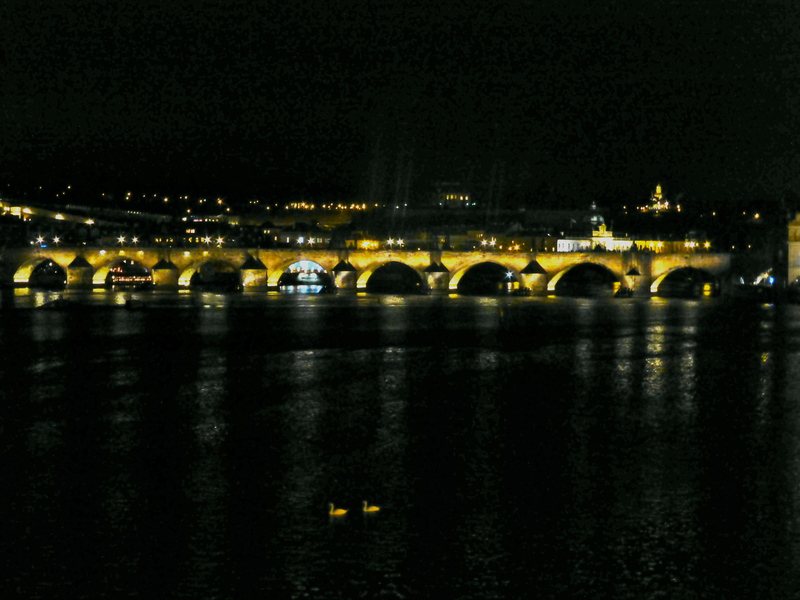 Prague by Night: Charles Bridge. We briskly walked back over the river and to the suburbs of town, happy to slip into our pre-booked sauna and soak up some deep heat! Day 2 called for a more positive return to Old Square. Mystical, charming, magical and bold. Old Town square, Prague – at Christmas. Reportedly one of the largest festive markets in the Czech republic, and having risen to the heady heights of featuring in ‘The Archers’ as the seasonal short break destination for Jennifer & Brian, I have to admit to finding the market somewhat of a disappointment… Perhaps my standards are too high now that London’s local markets have developed to include such enthusiasm, interesting variety and inciting atmosphere… spoilt with our local West Norwood Feast, Crystal Palace Food Market & Herne Hill… bursting with character and passion that seemed to be missing in Prague’s tourist trap effort. But we did enjoy a pop up concert, and tasting Christmas traditions – huge hams roasting over red coals, a mizture of potato gnocchi, saucerkraut and ham… soggy, slightly greasy and better in anticipation than reality! Also a fascinating sweet, cylindrical pastry called a trdelnik. Rolled around metal poles, stretched over hot coals and turned by chains at either end; sold hot, dusted with cinnamon, sugar, and nuts. an immense Gothic edifice whose 15th century towers rise 80 metres above the surrounding Medieval streets. Despite the jostling and hustling of packed crowds visiting the pretty Christmas Market, you can still soak up the legions of tumultuous history… heresy, revolutions, plots, and reform. Perhaps less has changed than you first think… more harmonious and settled now, but still a bustling market square at the heart of the town, a focus for locals and visitors alike. Vltava River’s many magnificent bridges. Next time, I’ll take a hike up the old clock tower in the Town Hall to take in an aerial view of the city… didn’t occur to us at the time, but the birds eye view would have been worth the climb, I’m sure. Just North of the Old Town Square is the Jewish Quarter. Yet another side of Prague – a more tranquil atmosphere, slower pace and greyer colours (trimmed with copious amounts of gold) to other parts of the city. Jewish Quarter, Prague. Reminiscent of Paris’ grand, leafy boulevards with fine boutiques; gold encrusted, inside and out. Walking along the main street felt like entering a Grimms Fairy Tale book… gothic towers looming eerily over grey skies, defining the road with strangely intimidating dark spires. Having had a very high recommendation to visit a particular cafe, next stop was to find Wenceslas Square. Another busy hub; the heart of the New Town, a business and cultural focus. More Christmas market stalls in what was originally designed to be a horse market, the square was named after the patron saint of Bohemia. Wide boulevards. Literally stunning, edged as they were with fringes of trees sporting fairy lights. Again, especially attractive in the dark haze of a winter’s night, marking out the twinkling bare branches engagingly. 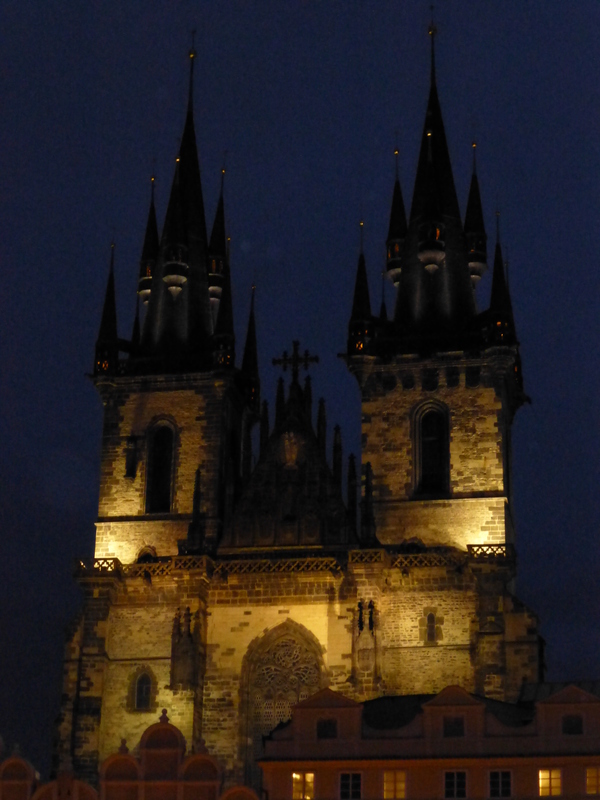 View from Wenceslas Square, Prague – photo taken before the tree lights came on, but still pretty impressive! We were so grateful for this tip from a local – Ovocny Svetoxor (literally translated ‘fruity cinema‘) would have remained an undiscovered gem without it. There are apparently branches across Prague, but the one we visited in the passage Svetoxor is the spearhead, having been here since the 70s… the psychedelic, block decor remains shocking but totally on trend (just not the same trend as anything else within a fair distance!). Bright, fast and fresh. Outside is an array of multi-coloured, glossy ices – too watery to be ice cream (and too frozen to try, despite looking otherwise irresistible). Fruit cakes, gateaux, sundaes, freshly made juices… I never knew that Heaven was based down this little alley in Prague! Ovocny Svetozor, Prague: Fruit cakes and pastries galore, but also a huge selection of fresh fruit, so the menu could be used as inspiration ignored as the customer lets their imagination rip! 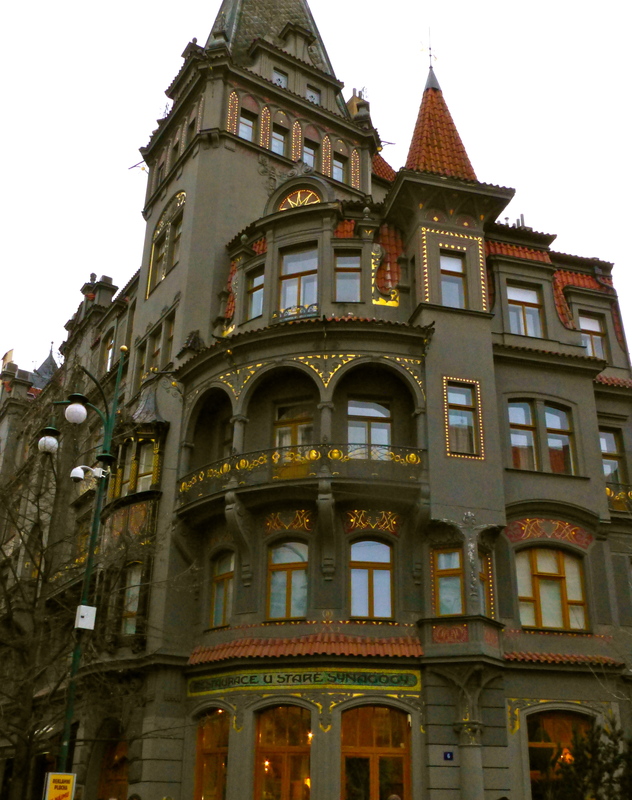 Ovocny Svetozor, Prague. For those with a less sweet tooth, a hugely varied array of Czech Tapas; ‘Chlebicky’ an array of items in copious amounts of mayonnaise, beautifully presented on sliced french type bread. Ovocny Svetozor, Prague. Where you choose your fruit mixes and watch them being blitzed into heavenly juices. Despite being small and packed, we found deep lime green seats to sink into, and enjoyed the freshest juices I have ever tasted. Then back through icy streets, now veiled in darkness but glowing in a romantic haze of the ivory light of street lamps. Castle view from across the Vltava, Prague. 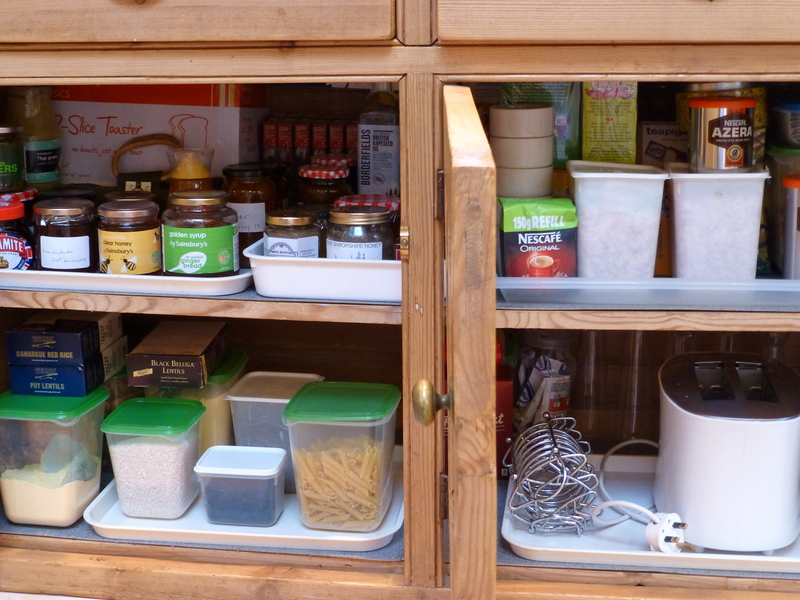 Our third day – packed with pottering. We walked along the top ridge from our hotel towards the castle – breathtaking views of the city in the crescent of the hill below. Stretching out on both sides of the broad icy river. Back through streets, admiring the huge painted blocks; wondering what was going on inside. Watching tourists being whooshed around in jolly cars or traps pulled by impatient horses. We found a huge Tesco, and had to go in to ‘spot the differences’… there were as many surprising similarities with regard to products and packaging as differences – a whole isle (double-sided!) of chocolate – acres of pastries and breads and unbelievably cheap alcohol. (Interestingly, no drunks though). 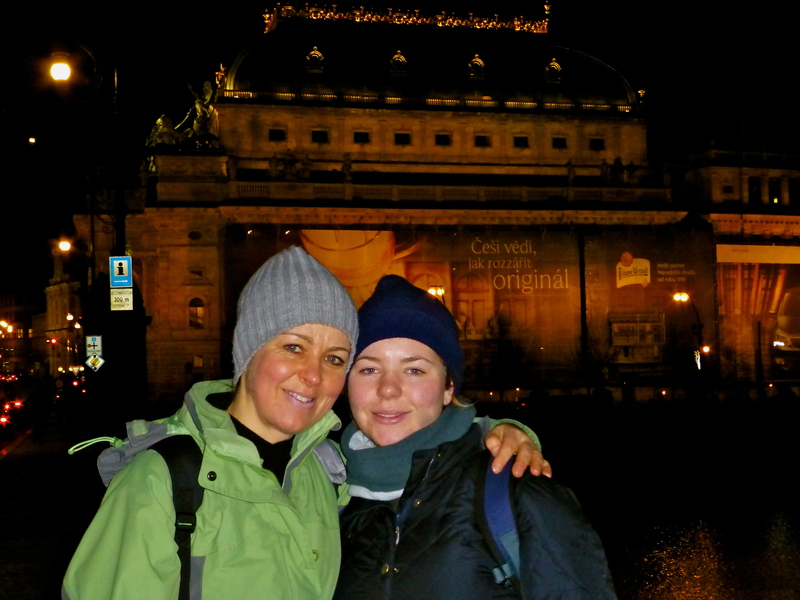 Walking around Prague in darkened streets felt safe – even as we stepped away from the centre of the city, making our way through graffiti littered streets to the outer district of our hotel. It was interesting staying further afield – seeing the environmental changes as we crossed through the city zones. Also watching more Czechs busy about their daily life, uninterrupted by mobs of tourists doing an impression of a couple of girls in IKEA on a wet Sunday afternoon. 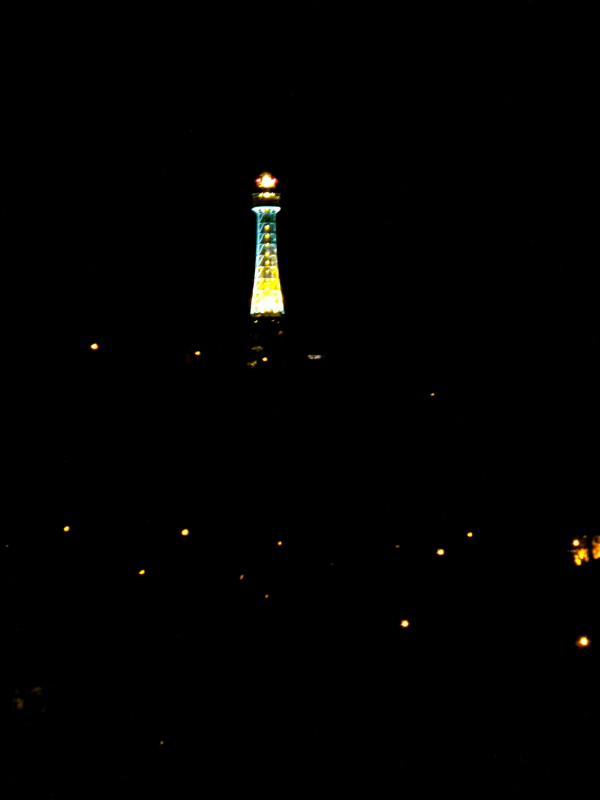 One seasonal sight that we would have totally missed had we been staying in the more trendy centre of town was the local Christmas preparations… heaps of Christmas trees being sold and marched home. As they would be on the streets of London, but these had many fewer needles. And those that were there, were longer and finer than those of the Norway Spruce or similar found at home. The tradition of eating Carp is another that is not shared at home. We were introduced to this on our first day, at the locals Farmers Market on the Rasin Embankment. Large blue plastic bins filled with running water and tightly packed with huge, sad fish. Jostling for space so that their fins often looked damaged. Being prepared on stalls that were reminiscent of the mass executions held in past times in the old square. Blood literally running down the street. Fish heads, placed upright next to their decapitated bodies as the scales were vigorously scraped off. Desperately, pathetically gasping their last airless breath as their mouths continued to open and close before realising that their lungs were no longer attached. One morning, walking through the outer district, we saw an old lady ahead. Looking forlorn – motionless on the pavement. As we neared, we noticed the familiar smell and sight of the large blue buckets. She had chosen her Carp and it was being prepared. She stood further away and turned as we passed, holding her head in her hands. Without looking, she gave a gasp as the clever cracked down. Although it seemed in a way barbaric, the fish were always kept in running water, and killed swiftly and professionally. Perhaps one day we will try fresh carp, to better understand the tradition which is clearly still so popular. Back to the warmth of the sauna for the final time. well worth it, especially at that time in the morning! great value and saves worrying about being ripped off! and waterproofs to go over them. If you haven’t got them, do! Pole dancing in the garden! my washing line seems to be the only thing that’s Growing In My Garden this week. Ensuring that the sheets have earthy brown trims after flapping over a wet lawn for a day or so? My redundant IKEA curtain pole, having lost a ‘finial’ during building work, came to the rescue! I’m suffering from not having ‘my time’ outside this week. billowing around such a pretty pole makes up in parts. Hoping next weekend will be less frantic, and sunnier. 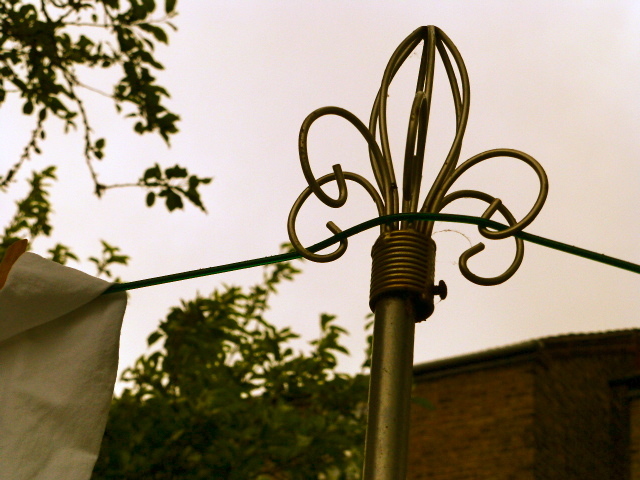 Ode To a Washing Line. 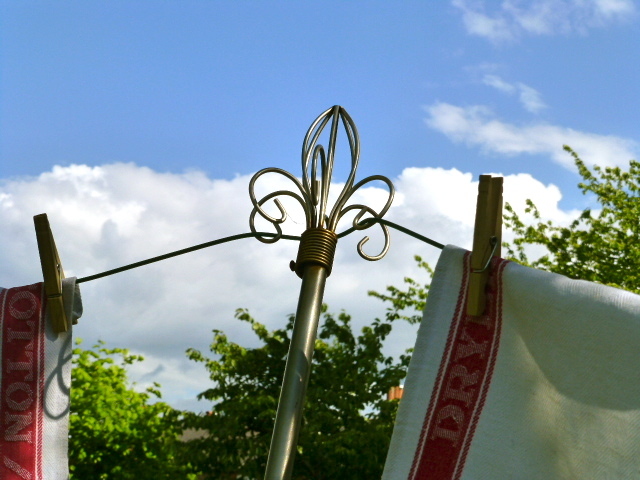 sights you see in the open air, on a swaying washing line. Pyjamas are always so tired it seems, fall asleep if given the chance. never being let-down for fun. – Annie’s wonderful weekly collection of inspiration and awe at Mammasaurus. Curtains to the old washing pole! 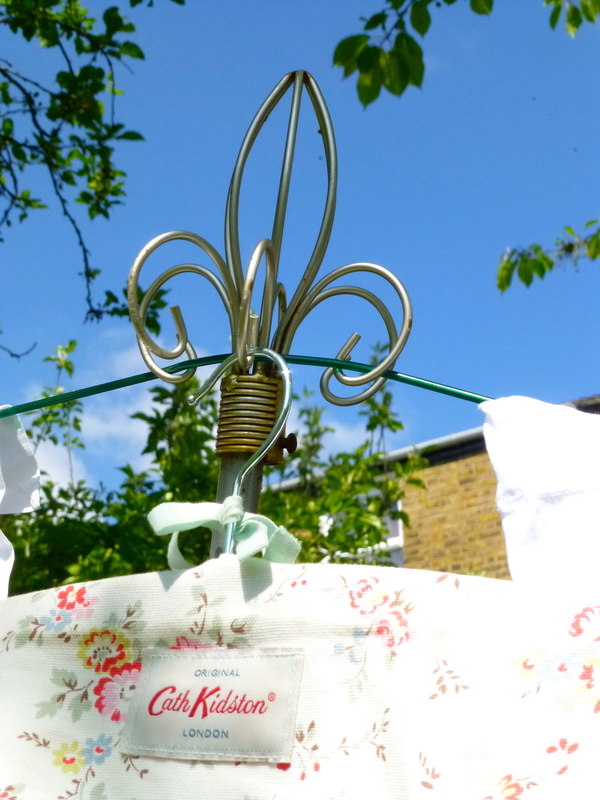 What have you ‘upcycled‘ for use in your garden? Happy Easter. Helter Skelter Egg Run. May your eggs be plentiful and yummy! As a chicken keeper, who is not very keen on chocolate (really!) 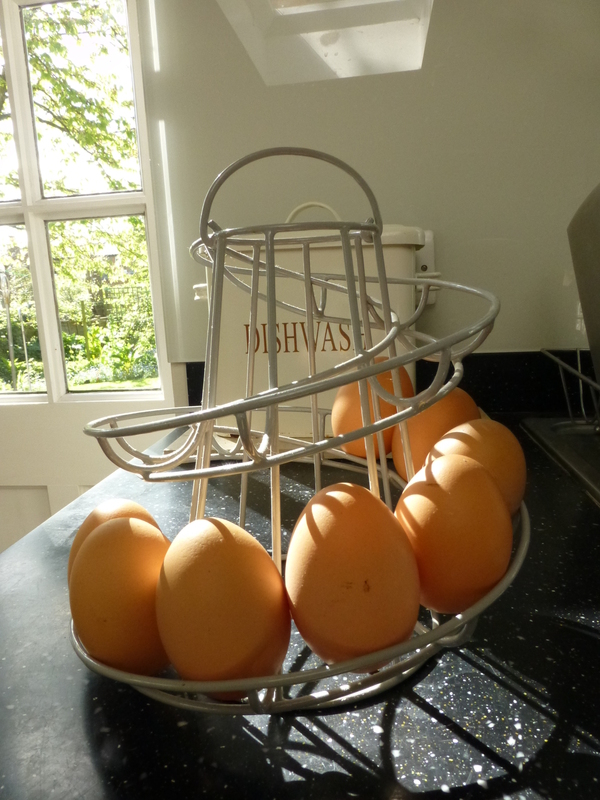 finding and enjoying eggs is more of an all year pursuit than a seasonal treat – perhaps with a few weeks off midwinter when the chickens focus on keeping warm rather than egg production. More robust, quirky in design and cause for an everyday smile. The definition of ‘Helter Skelter’ is In disorderly haste; confusedly; haphazardly. although that may apply to the fairground variety, the Helter Skelter is anything but when used as an egg run / store. What I love about it is that it effortlessly orders the eggs – so that if you want the freshest for poaching you take from the top. But when baking you’d go for one at the end of the run… And gently guide the others down to take its place. We used to date each egg when taking it out of the laying box, but that’s no longer necessary. I got mine from Amazon UK – I’m sure they are easily available from outlets worldwide too. My parents used to hide a new dress in the garden as an Easter present for us to find instead of the eggs – I remember finding a lovely bright red dress one year – I put it straight on, then went to church and ripped it on the railings on the way home. My mother mended it with iron on mending fabric… strange the things that we remember. What does Easter mean to you? Oh Crumbs – That’s Amazing! Yesterday was another wet – no, torrentially rainy, cold spring day. What is going on with the weather – we have guests from Germany who say that the spring we should be enjoying is equally illusive there, and I was speaking from a lady from Italy who said the same – cold and damp. Grr. We had run out of biscuits and I really didn’t want to go out to get more. There was some fresh bread left from breakfast, so I had a look on line for inspiration, and found a solution to the problem of the empty biscuit box and the left over bread… Breadcrumb Cookies! This recipe is on a site which I really enjoy – ‘Thrifty Fun’ – thought I would share it because it is so amazing – as many of their ideas are. 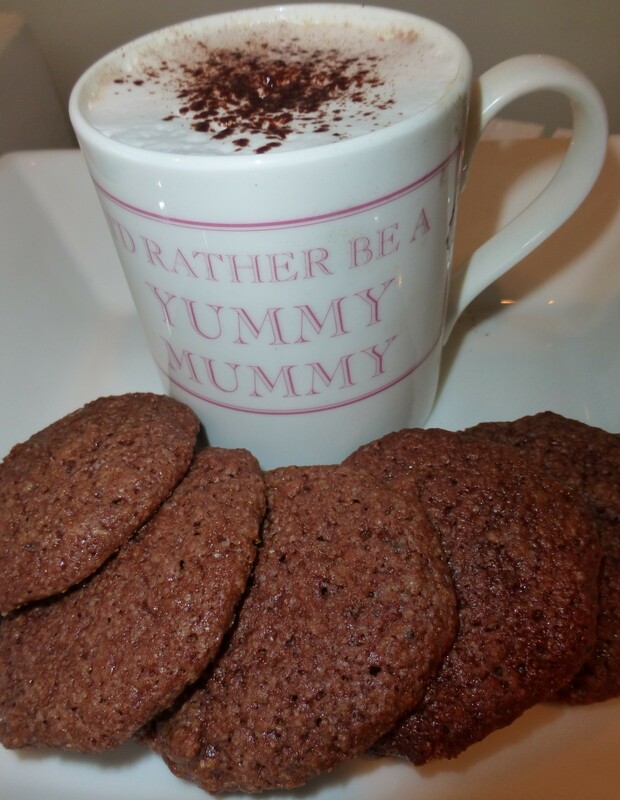 I wouldn’t say that they are the best cookies ever, but they are good, and definitely worth making – if only just to use up those scraps of bread that look lonely, and to entertain and amaze yourself on a wet day! 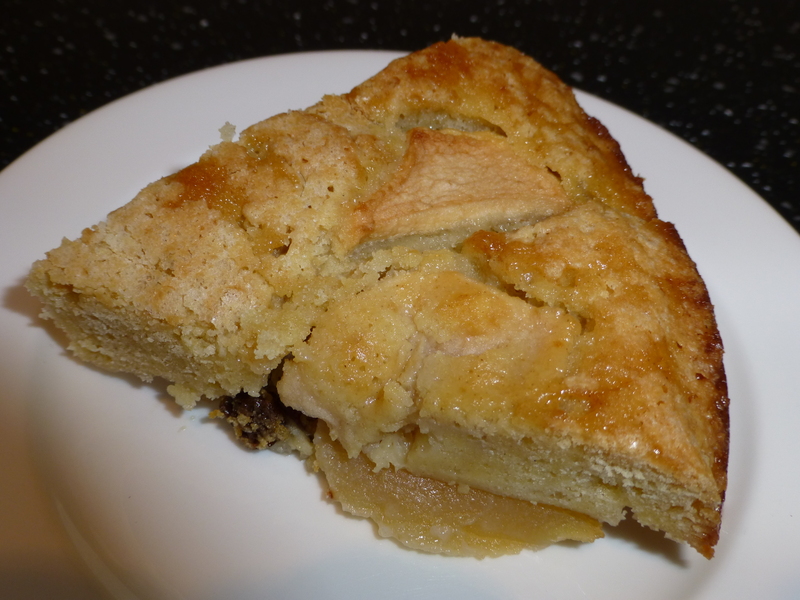 Apple Cake Experimentation – 3 recipes that came out as winners. 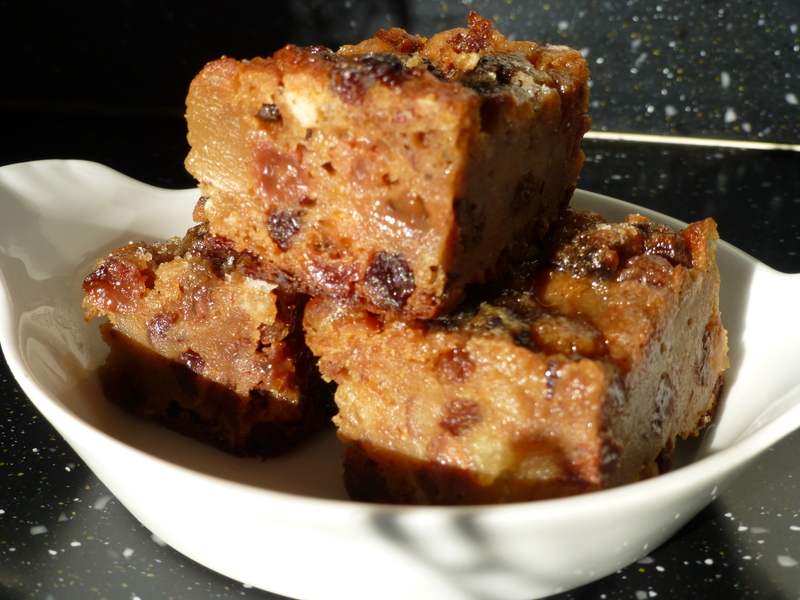 We’ve been experimentating with different apple cake styles and recipes over the winter. It’s been interesting, made the house smell wonderful and provided us with a great excuse to have the oven on, which has helped the log burner heat up the kitchen – win, win, win! Here are the recipes for three of our favourites – all very different. 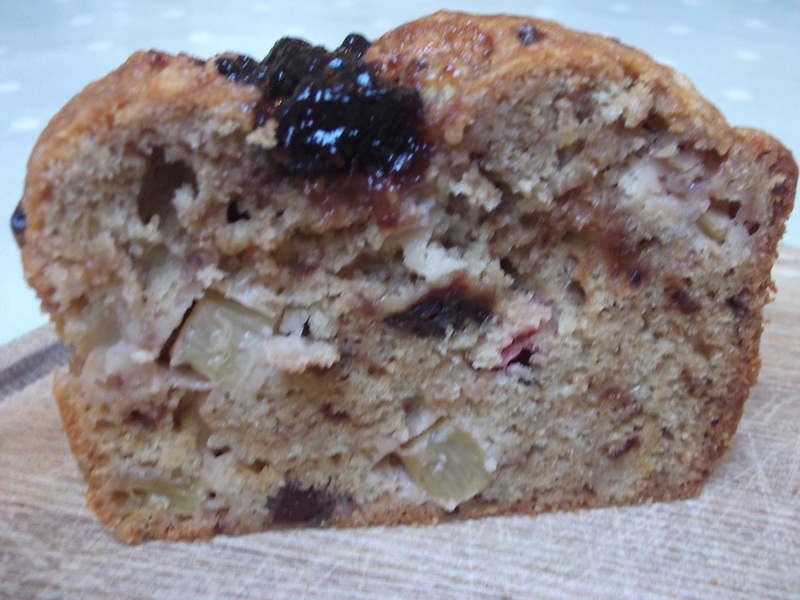 Chunky Apple & Plum Loaf Cake. We made it in a loaf tin… just for a change, but you could use a regular round tin if you prefer – use a 1Kg / 2Lb loaf tin or a 20 cm round tin lined with baking paper. This recipe is adapted from one found in BBC Good Food Magazine. 1. Preheat oven to 170c or Gas 4. Line loaf or cake tin with baking paper. 2. Rub the flour, butter and muscovado sugar together to make fine breadcrumbs. Reserve 5 Tbs of this mixture and mix it with cinnamon and demerara sugar for topping. Set this reserved mixture aside. 3. Mix apple chunks and eggs. 4. 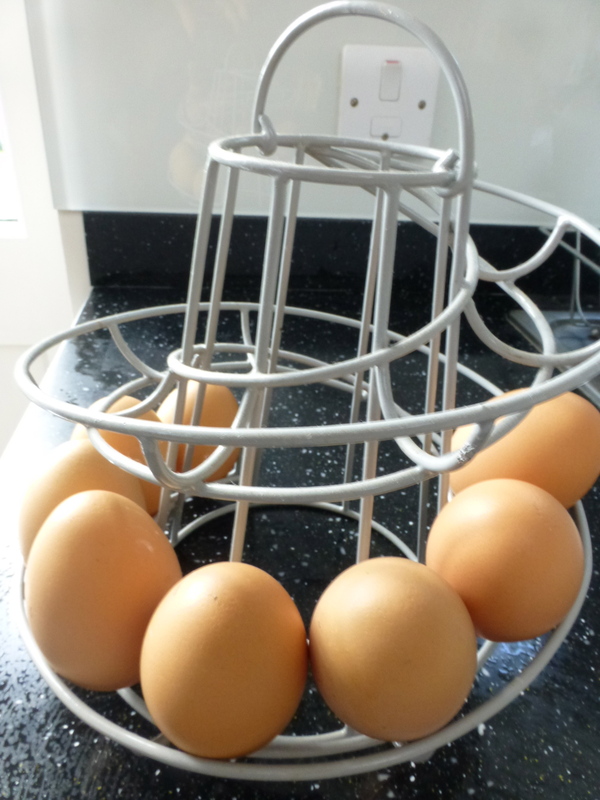 Stir baking powder into rubbed in mixture, then quickly and lightly stir in the egg mixture – don’t over mix. 5. 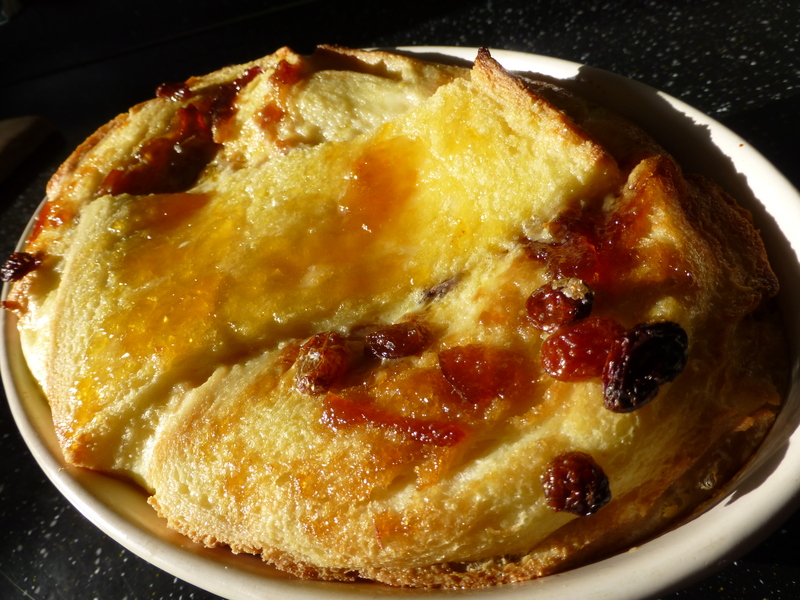 Spoon into the tin – if you have enough jam, you can dollop some jam in as you spoon cake mixture in. 7. Spoon reserved crumble / sugar over the top, avoiding jam. 8. Bake in your preheated oven for 1 hour and 10 or 20 minutes – test with a skewer & it’s cooked when skewer comes out clean. Cover with foil after about 50 minutes. Recipe 2 – Apple Cake with Syrup. 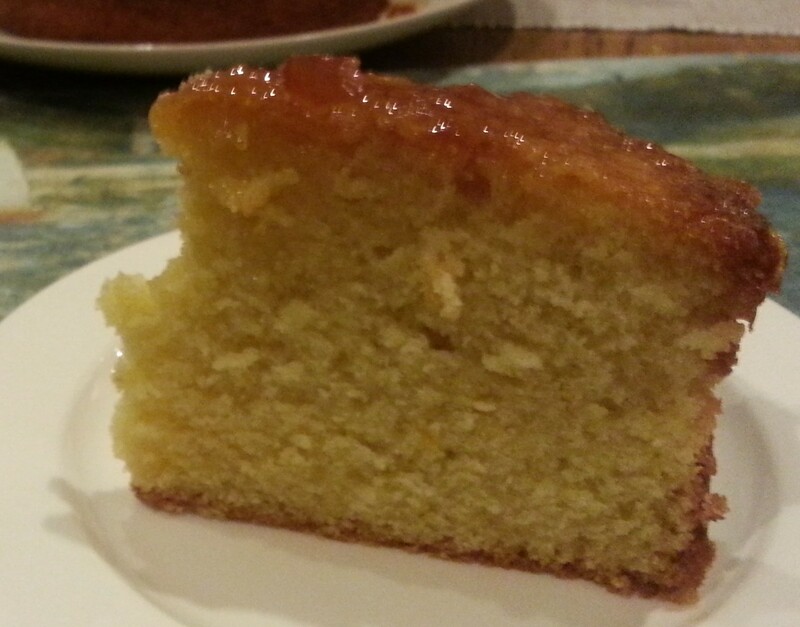 This is a very different cake, made with semolina – higher in protein than flour. This cake has no added fat and the main sweetener is the maple syrup. There are different grades of ‘maple syrup’ sold, and as always you get what you pay for – genuine maple syrup has a low GI in contrast to cheaper varieties, which often contain a low element of maple syrup (therefore less taste) and often have a much higher GI. This is great with greek yougort or vanilla ice cream. Line a 20 – 22 cm cake tin, or make in a flapjack type tin – 32 x 22 cm, lined. Heat oven to 180c or gas 4. 1. Mix eggs and sugar with a whisk until light, creamy and thick. 2. Add some of the semolina, then some of the water and vanilla. Add the rest of the semolina, baking powder, water, vanilla and oats. Mix well. 4. Spread into tin. Sprinkle with almonds if using them. 5. 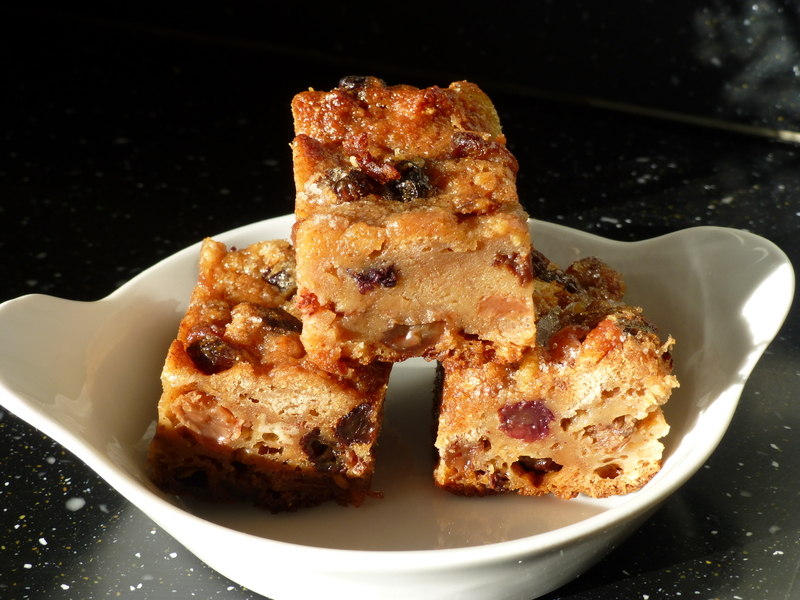 Bake for 20 – 25 minutes if using a flapjack style tin, or longer if using a cake tin – it is ready when a skewer inserted into the centre comes out clean. 6. Allow the cake to cool. Heat the syrup for a little while in a small saucepan – don’t let it burn, but do let it thicken a little. Then pour it over the cake – slowly so it soaks in. 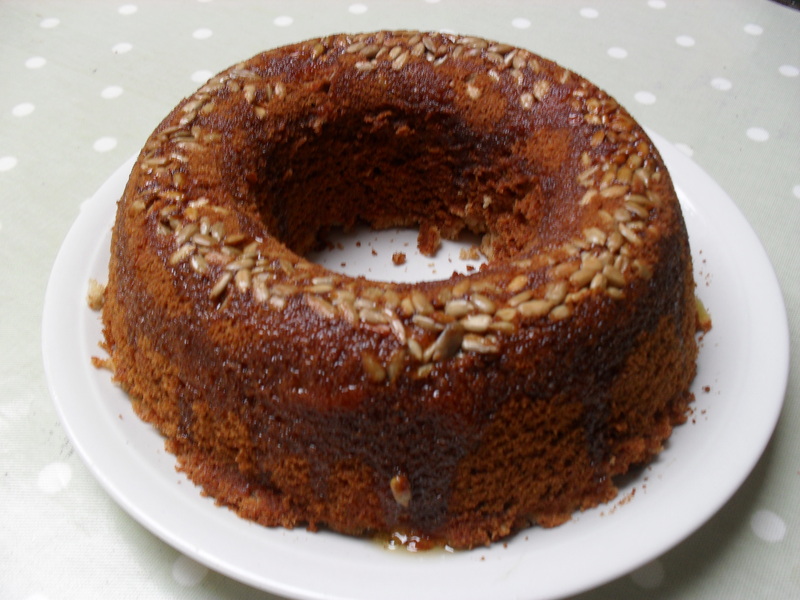 Recipe 3 – Apple, Sunflower seed and Honey Cake. Sunflower seeds are great little packets of goodness – they contain lots of vitamin E, which has been said to help to reduce cholsterol. They also contain a lot of magnesium, which is needed for strong healthy bones and also for regulating the flow of calcium to the blood vessels and muscles. They also contain selenium, which has been found in some studies to inhibit cancer cells… and the Vitamin E that they contain is claimed to help prevent UV damage to the skin by the sun. We made this in a ring tin – one with a hole in the centre. We greased it well first, and it turned out wonderfully. Preheat oven to 170c or Gas 5. 3 cups peeled, chopped apple – chop quite small. Honey to pour over – use a spoon heated by pouring boiling water over it first to help. 1. Sprinkle some of the sunflower seeds into the greased tin. 2. Use an electric mixer to beat sugar, honey and oil. 3. Beat in eggs, one at a time, adding a little flour with the last couple if necessary. 4. Gently beat in rest of dry ingredients, then fold in vanilla, rest of sunflower seeds & apple. 5. Cook for 50 – 60 minutes. Cool in tin for about 10 minutes when taken out of oven. 6. Turn out onto a wire rack to cool, and very carefully pour over more honey – it helps this absorb better if you heat the honey gently in a pan first. You may want to prick the cake gently too, to help absorption. Delicious served with vanilla ice cream, custard, creme fraiche or greek yogurt. – Do you have any recipes that you’ve found to be family favourites?